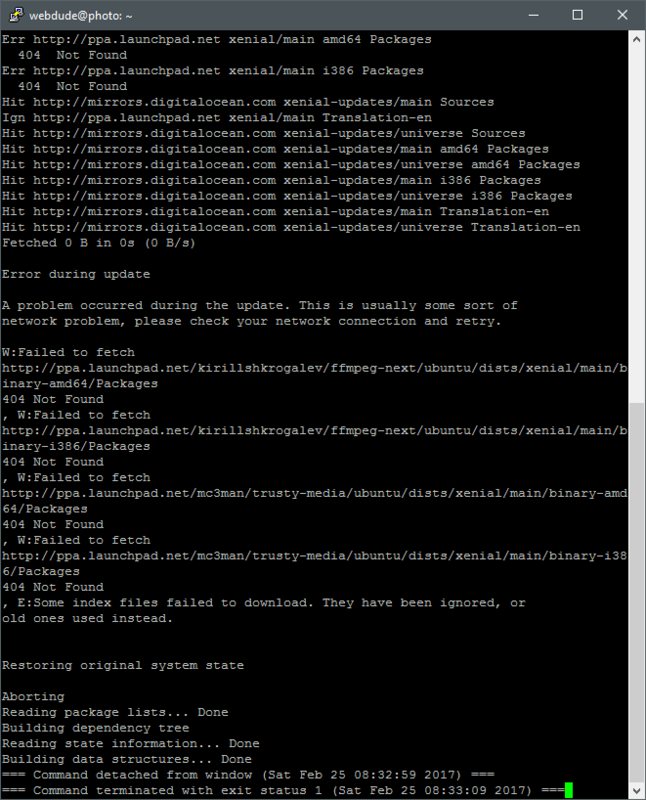 Issue: Attempting to upgrade Ubuntu 14.04 to 16.04 generates Failed to Fetch errors and the process aborts. The cause is custom PPA (Personal Package Archives) sources that are used for some software, in my case FMPEG. Solution: Check your sources.list or sources.list.d files for the PPA’s. I found the my offending repositories here: /etc/apt/sources.list.d. For FMPEG I commented out the active repositories in ‘/etc/apt/sources.list.d/kirillshkrogalev-ffmpeg-next-trusty.list’ and ‘/etc/apt/sources.list.d/mc3man-trusty-media-trusty.list’. I then Re-ran ‘do-release-upgrade‘ and Boom! we’re rolling!